Synopsis: Meghan Chase has a secret destiny; one she could never have imagined. My Review: I'm going to be honest. I don't know what kind of review this is going to be. I have some things to say about this book and I'll probably spoil something so I wouldn't continue any further if you haven't read it yet. I have no idea what A Midsummer Night's Dream is. Not a clue. Now, both reading and writing have been my hobbies my whole life; is it bad that I don't know my classic literature? Whatever. THIS book, I DID read! I'm not sure how I feel about Meghan. I have a hard time remembering her name; not many call her by it. They like to use more fitting names like princess or half-breed. I admire her courage, which sounds corny but I don't think it has another name. She's not well-off, lives on a farm and is tormented at school, yet she makes the best out of it. I'm never fair when it comes to how I feel when the main character first encounters the paranormal. I always want them to accept it right away and not question what they thought they saw - just believe. Of course, it never happens that way and that's okay because when Meghan finds out that her brother has been kidnapped and a changling left in his place, she sets out on a mission to find him and never - and I mean never - backs down. Each character stood out uniquely enough in their own way that it was easy to remember who-was-who and who-was-what. Each action scene was intense but a little hard to play out in my head, but maybe that was just me. I noticed that Kagawa liked to use the same words too closely together, a paragraph or two after the other. I like variety. Impress me with your extended vocabulary and visually stimulating metaphors! I've read a lot of reviews on the Iron Fey series because everyone is talking about how great they were and everyone was either Team Puck or Team Ash and...and I wanted to be on a team so I knew I had to read them. I anticipated the next Twilight-type romanticism and that by the end, I would know where I stood. However, I didn't get that at all. Puck has always been there for Meghan and it sounds like he expects her to be with him. He's very much the big brother/protector to her as well as playful and cheerful. It wasn't until one very awkward moment when Puck is preparing to fight (someone I don't remember - maybe Ash), he asked Meghan for a kiss. Even she was confused! Never before had Puck showed that he was into her like that. But watching him get jealous over Meghan and Ash's flirting was pretty amusing, which brings me to my next point. The Ice Prince and Meghan have an odd "relationship". It consists of very little, if any, emotional sharing but more lingering looks and close encounters. Um, and he's trying to kill Meghan and Puck in the beginning and by the end I think he still would. 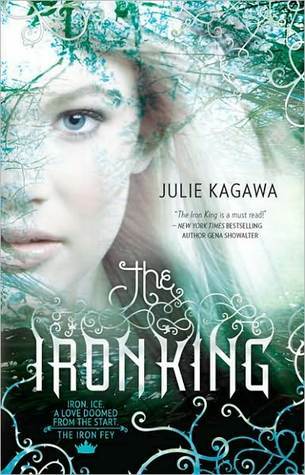 When Meghan and Ash venture into the Iron Kingdom to stop the Iron King, they grow closer and discover intense feelings they have for each other. But with them being fey of opposite courts, Summer and Winter, it seems it will be impossible for them to be together. Of course there are still those lingering yet confusing feelings she has for Puck! Grimalkin is by far my favorite character. A cat that knows just about everything, is impressed by nothing yet is utterly entertained by Meghan and the precarious situations she finds herself in. He tends to disappear when the going gets tough (he's not a fighter) yet reappears when Meghan needs him most. In the midst of all this is the discovery that the man she knew as her father, is not but instead the king of the Summer Fey, Oberon. He speaks of her as his daughter but doesn't treat her like one which only increases my wonder as to why I've always wondered why fey were not more kind and loving. Why do they have to be so...feral, all the time? Speaking of which, Oberon's wife and Summer Queen, Titiana as well as the Winter Queen, Mab, are not friends of Meghan or her antics in the Nevernever. Overall: The combination of all these characters and the danger that faces them all make for a very exciting read! Action, light romance and a can't-put-down adventure!